The Garden Shed at NFMOA was originally a chicken coop with two large lean-to extensions that were removed when NFMOA took over the site. The front of the building was rebuilt from weathered redwood planks saved when the lean-to extensions were torn down. The space inside is used, as the name suggests, to store gardening tools and supplies. I also store much of my used lumber and wood inside. 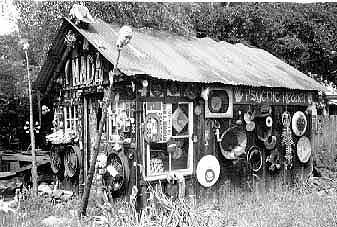 The Surfaces of the Garden Shed have been accumulating objects, images and decorations since 1978. I use the door as a place to put excess paint when cleaning my palette. The surfaces provide me with a place to store some of my found objects. I like to look at them and by having things out where I can see them, I do not forget what I have in my inventory. When I need a particular kind of object to complete a work in progress, I often stroll around the Garden Shed in hopes of finding just the right thing. Because of this, the collection of adornments and decorations changes over time. Each wall of the Garden Shed is used in a slightly different way. The South wall gets the most rain and sun. I use it to age and weather wooden objects, to rust metal and to mildew string and fabric. It is also where we store our collection of circular found objects. The vegetable garden which is on the south side of the Garden Shed seems to benefit from the proximity of all the found mandalas. The East wall is the least often viewed because it is the back and faces away from the rest of the NFMOA compound.& It gets some sun and a little rain, so objects here age more slowly. This is the area where I store a lot of scrap metal for future welding projects. The North wall gets no sun and almost never any rain. So this is where I put objects I want to see but do not want to age or weather much. The West wall is the entrance and is the most readily visible. It gets a lot of rain and all the afternoon sun, so I use it for display, playing with the sunlight and some weathering of objects. The photgraphs below show some of the development of the Garden Shed from 1978 to the present. There are also some closeup views of some of my favorite parts.